We know meeting someone for the first time can be intimidating and going to a church for the first time can be nerve-racking. We want to help make your first experience with Dover Baptist a great one! Dover Baptist meets every weekend on Sunday morning at 151 Washington Street, Dover, New Hampshire. Sunday’s at Dover Baptist are impactful, casual, and relaxed. Come as you are and expect to feel welcomed as our guest. In total, a Dover Baptist Church service is about 75 minutes in length. Services begin with times of worship and greeting. Song lyrics are projected onto the screens so you can sing along and/or engage with worship however you feel most comfortable. After the music portion of the service is complete, our pastor will come out to share a message about Jesus. For those who are in need, our facility is wheel chair accessible. Inside and outside ramps and an elevator allow for easy access to all resources. Rest rooms are located on the ground level and on the first floor. If you have any questions or feedback we'd love to hear it. Drop us a line using our contact form. Each week we offer children's church for kids aged 4 years old through 4th grade. Kids will be dismissed from the worship service by the worship leader. 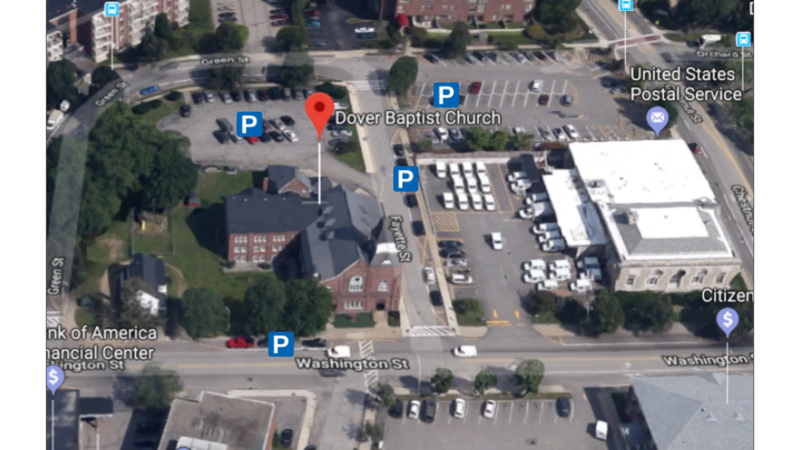 Dover Baptist has a generous amount of on-site parking. There is also limited on-street parking on both Washington and Fayette Streets. The US Postal office has graciously granted us permission to use their parking lot on Sundays as well.